It has gone down in the history books as the super outbreak to rival the original of 1974. 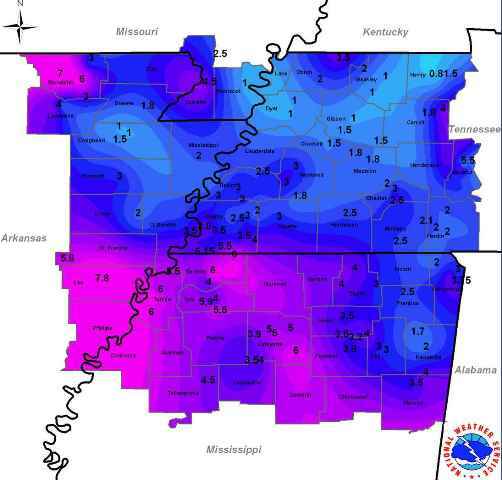 In fact, many of the stats indicate that it has surpassed the Super Outbreak of 1974 in many respects. The month of April was the most active tornado month in U.S. history and the 4-day period from April 25-28 saw over 200 tornadoes produced in 5 southeastern U.S. states, killing 316 and injuring more than 2,400. 15 of the tornadoes were rated violent (EF-4 or 5). Total damage is estimated at $4.2 billion from storms on this day alone (all statistics from "The Historic Tornadoes of 2011," a NOAA Service Assessment). 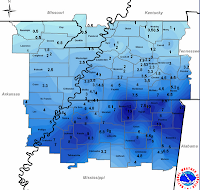 The nearest significant damage from this outbreak was not the highly-publicized Alabama tornadoes, but a monster EF-5 that nearly wiped Smithville, MS (130 miles southeast of Memphis) off the map. It was the first EF-5 recorded in the U.S. in three years and occurred almost simultaneously with another EF-5 about 100 miles south near Philadelphia, MS. 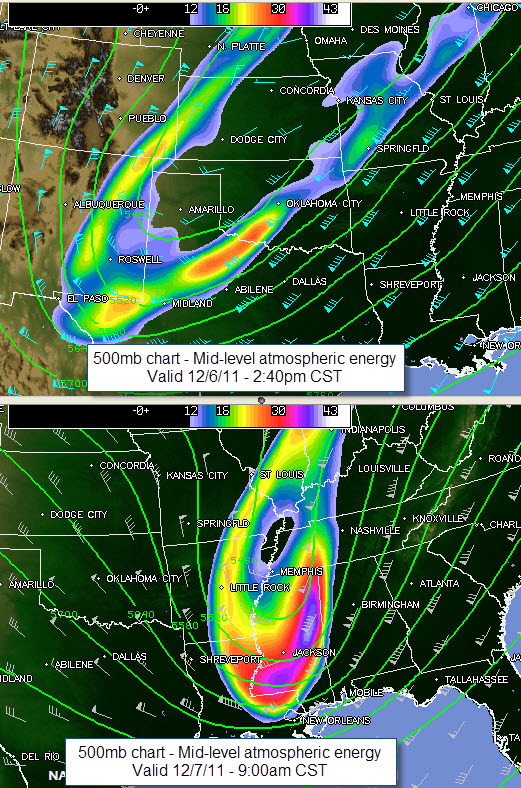 Maximum wind was estimated at 205 mph along the 37-mile path of the twister. In all, 17 people lost their lives and 40 more were injured. A recap of the event, authored by WTVA meteorologist Jennifer Watson and MWN meteorologist Erik Proseus, appears on the MWN Blog and a video tribute can be found here. Below are photos taken in Smithville three months after the storm by Erik. Indeed, even though there were dozens of severe weather reports in the metro over the 3 day period (see image above), the Memphis area was actually spared from what could have been utter chaos similar to what was seen in places like Smithville, MS, Tuscaloosa/Birmingham, AL, and many other places in the southeast. The greatest effect on Mid-Southerners from this outbreak though, in our opinion, was not from property damage, but on our psyche. 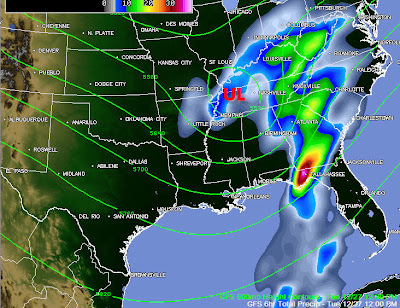 The extended period of destructive weather was well-forecast, beginning nearly a week ahead of time, and it received a lot of airtime (and a lot of hype) leading up to, through, and after the events that occurred. The Memphis area was under a moderate risk of severe weather for two days, upgraded to a high risk on one of those, and then a slight risk on the day that all hell broke loose in MS and AL. Multiple waves of severe storms, all capable of producing damage and potentially loss of life, passed through the region and at times it seemed the tornado sirens would never stop sounding. All of this affected the psyche of the general public in different ways. Some grew weary and began ignoring the warnings, which led to a complacency that is far more dangerous than the Weather Service missing a tornado warning. Others grew fearful and became paralyzed, which leads to indecision during critical times. Both of these have the opposite effect of what SHOULD be the public's reaction to severe warnings, which is to take action. 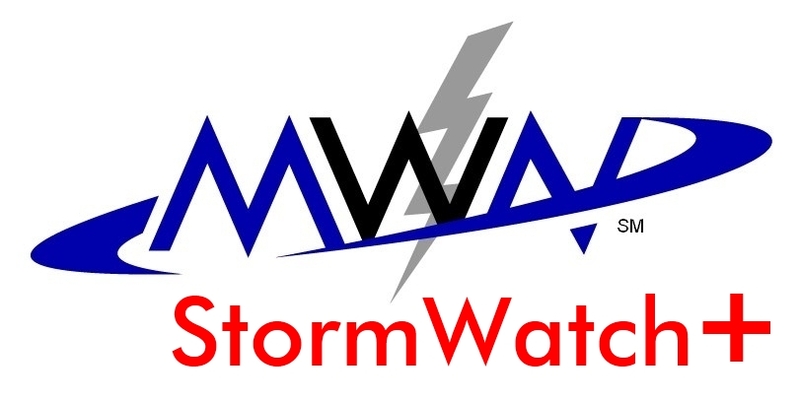 Part of MWN's mission is to ensure that the public is properly informed and prepared in case of severe weather; another part is to make sure that the public knows when to exercise their safety plan. Through our severe weather nowcasting on social media, we hope to accomplish both of these. Our stats for the months of April and May indicate that we are doing a good job in both regards. However, if we can reach more people, our hope is that the sense of complacency is replaced by preparedness on a broader scale. If it saves one life, it is well worth the effort. We now come to the #1 event in our countdown of the Top 11 of ’11 and without a doubt it’s an event Memphians and Mid-Southerners are sure to remember for years to come. With a long, snowy winter for much of the country in the rearview mirror, the warmth of spring began the annual melt of the deep snowpack in the northern states, sending large amounts of water into area rivers and tributaries. All of this water would begin flowing downstream into the Mississippi River by April. Meanwhile, multiple excessive rain events during the spring across the Ohio Valley (300% of normal) and Mid-South led to even more water pouring into the Mississippi River watershed. This combination of events led to a “perfect storm” of sorts, setting the table for an historic flooding event for the area. 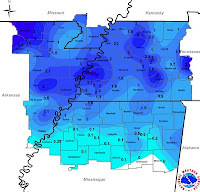 While flash flooding and tributary flooding of rivers like the Wolf and Loosahatchie were a significant problem early on, especially in areas of northern and eastern Shelby County, the impacts from flooding on the Mississippi became much more severe and widespread. Record or near-record crests were forecast at multiple points, including Memphis. Making matters worse, backwater flooding from the Mississippi into the area tributaries would keep those water levels high as well, putting even more people at risk. As the waters began rising and homes and businesses became threatened, people evacuated to higher ground, waiting to see how high the river would go. 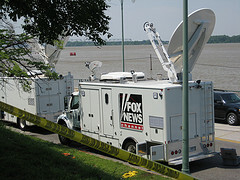 That day came on May 10, and with much of the national media in Memphis, the river crested at 48.03 feet, just inches short of the all-time record of 48.7 feet during the Great Flood of 1937. 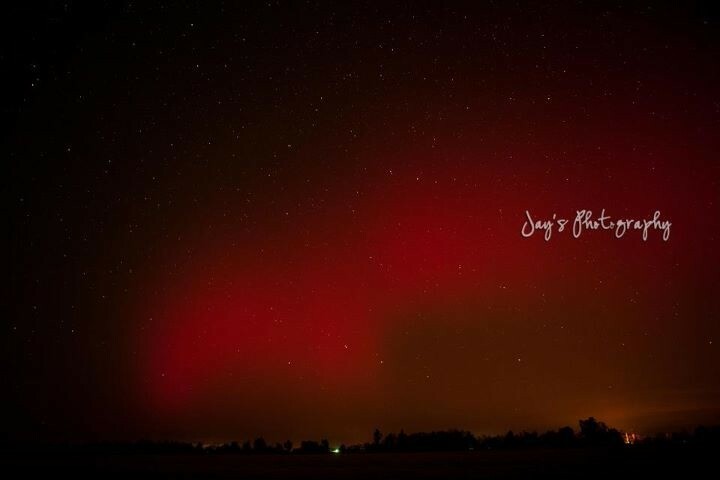 Pictures taken by MWN meteorologist Erik Proseus are contained in the photostream below. In the days following, the waters would slowly recede, allowing people to return home and begin the cleanup process. Slowly but surely, affected businesses reopened, including the Tunica casinos which had been closed for weeks. While the floods were devastating for many, they also brought people in our area together. Whether it was to donate to those affected or fill sandbags to keep the high waters at bay, it presented a classic example of the community spirit we often see in the area. Though the Great Flood of 2011 is now a memory, it’s an event that will be well-recorded in the history books and a memory that will remain with many of us for the rest of our lives. For NOAA's perspective on this billion-dollar weather disaster, watch the video below. Thanks for following along on this five-part blog series. It's definitely been an amazing weather year in the Mid-South and across the nation. In fact, the U.S. experienced a record ELEVEN billion-dollar weather disasters in 2011. Let's hope that 2012 is a quieter year weather-wise! I also want to thank MWN intern Kevin Terry for contributing to this series, as well as his dedication as a blog and social media poster for MWN! Kevin is signed on with MWN through the first half of 2012 and will continue with his regular duties through that time. 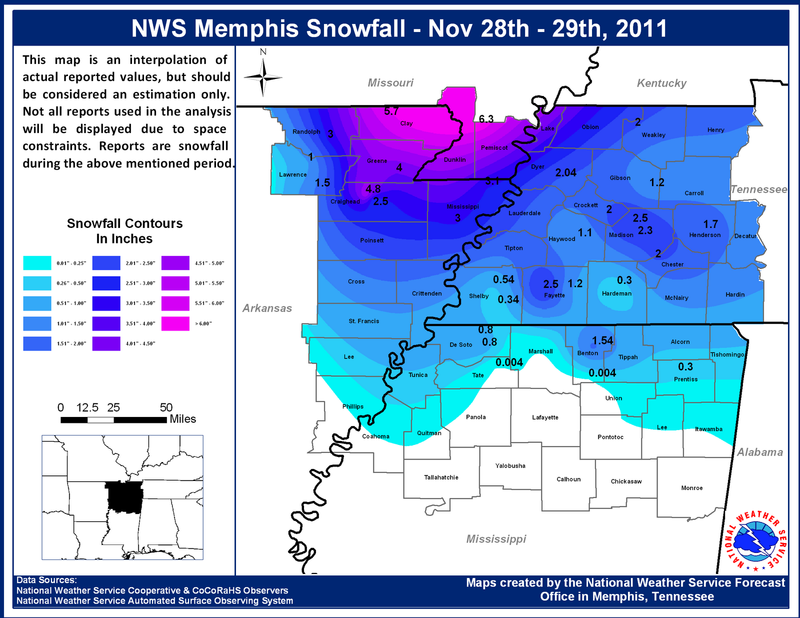 Follow along with MemphisWeather.net on Facebook and Twitter throughout 2012 for the latest weather conditions, forecasts, stats, and nowcasts. Merry Christmas! Well, it's not snow, but it is a couple of rain chances that we'll deal with over the next 60 hours or so. 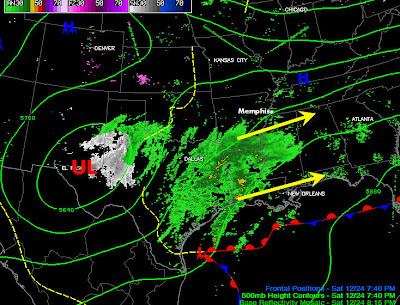 The responsibility for the rain chances falls squarely on an upper level low pressure system currently centered over far western TX (see the image below). The first round of rainfall will move mainly over the Gulf Coast states with the northern edge of it roughly paralleling the TN-MS state line overnight tonight. A few lingering showers are possible Christmas morning, mainly over north MS, but rainfall amounts over west TN should remain very light tonight if it rains at all. Once this first slug of moisture moves by, we'll be waiting for the next round, which arrives Monday into Tuesday. 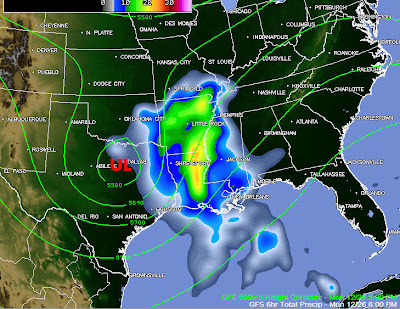 The greater Memphis area will see much better rain chances with this one as the low itself finally ejects out of west TX and moves towards Dallas by Monday evening (see next image below). In fact, some areas could see heavy rain on already wet ground on Monday evening/overnight. 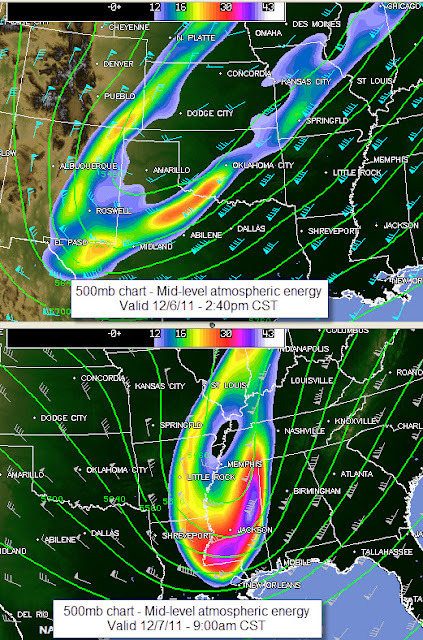 By Tuesday morning, the computer model used in these images (GFS) indicates that the upper low will be moving directly over the Mid-South. Though the main area of precipitation will have moved east of us, showery weather is typical with passing upper lows, so that is what we expect until the low moves by mid-day Tuesday (as shown below). We'll keep a very close eye on Tuesday morning temperatures as well. Though temperatures are expected to remain above freezing, we'll monitor for the potential for a few snowflakes as the system moves overhead that morning. Once it finally moves east, the weather pattern looks drier for a few days to end the holiday week. 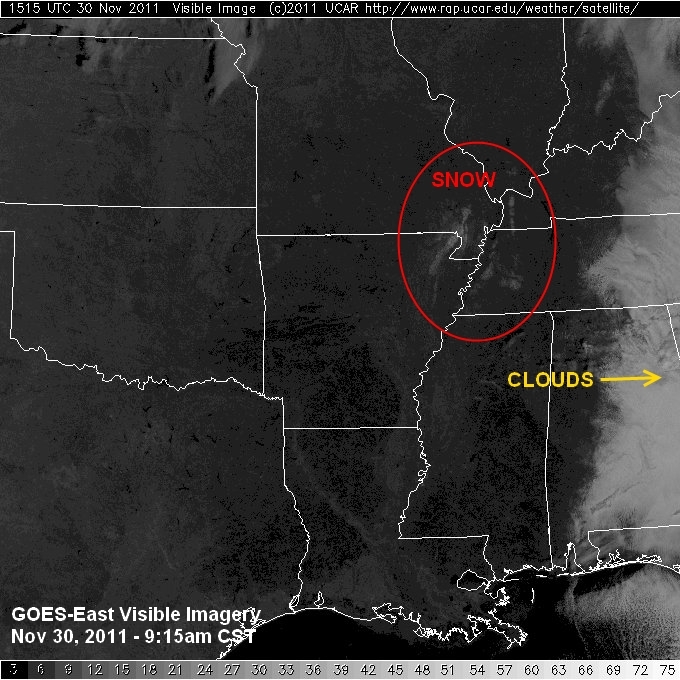 For MemphisWeather.net, I wish you and yours a blessed and wonderful Christmas Day! 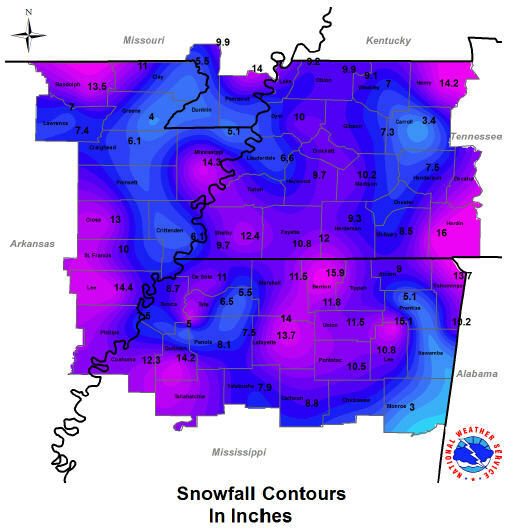 In our last blog post on Sunday, we noted computer models were having a very tough time figuring out the weather pattern over the Mid-South for the latter part of the week, including Christmas weekend, and that the forecast was subject to change as the week progressed. Now, 72 hours later, models have come into agreement on one potential storm system during this period for Thursday, but unfortunately there still remains some disagreement and uncertainty concerning the weather on Saturday, Christmas Eve, especially. A closer look at the latest possibilities for the holiday weekend is coming up. First, model agreement and confidence for the next 24 to 48 hours has considerably increased as the next storm system to impact the area will soon be developing and moving through the area. After a warm and rainy Tuesday, much cooler air has filtered into the region following the passage of a cold front overnight. However, this front will be stalling later today just to our southeast, as low pressure develops over Louisiana tonight. This low pressure area will track northeastward along the stalled boundary Thursday which should spread more rain into the Mid-South. Rain should begin by morning and persist much of the day, tapering off during the late afternoon. It will be a much colder rain than what we experienced Tuesday, with temperatures likely to hold in the upper 40s to near 50 degrees during the day. Rainfall amounts look to be rather heavy, around an inch (see image below). You’ll want to have the rain gear ready again for Thursday and allow for extra commute time, especially during the morning rush. GFS model rain totals from 6am-6pm Thursday, with 1” totals indicated across the Memphis metro . As the low pressure area departs Thursday evening, drier conditions will once again return as weak high pressure begins to take hold. Friday should be a dry day, but low-level clouds will likely linger with temperatures remaining on the cool side, in the upper 40s. Uncertainty comes back into play for Saturday, as models continue to struggle over a potential storm system developing and passing to our south during this period. Models appear to finally be coming into agreement over the actual presence of a low pressure system, but continue to differ on its exact track and placement of any associated precipitation, which will impact whether the metro area sees any rainfall. At this time, there still appears to be at least a low chance for rain, with the greatest opportunity likely to occur around Saturday night. Rainfall, should it occur, would be on the light side, and temperatures appear as if they will remain warm enough to keep rain as the only possible precipitation type. No matter the impacts it brings to our area, it looks to move off to the east Christmas Day, which means drying conditions and clearing skies should occur, with temperatures remaining near the seasonal average, in the lower 50s. 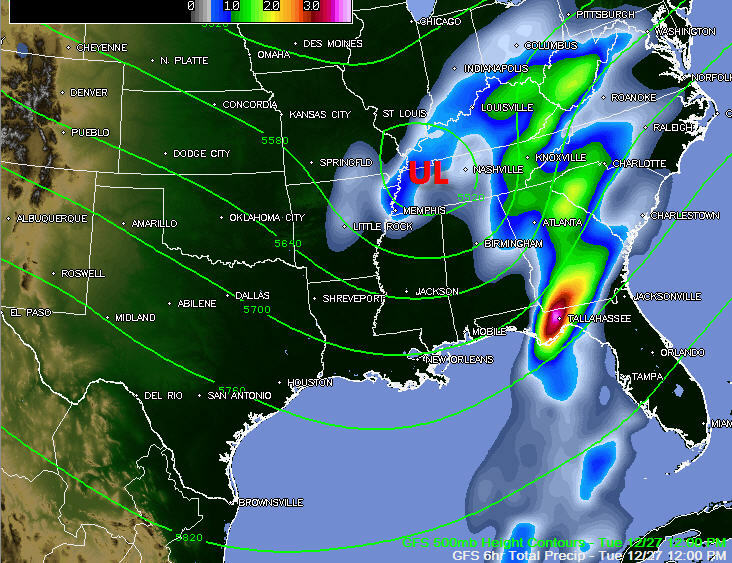 GFS weather depiction for Christmas Day at Noon. Any light rain Sat night will have exited to the east, with the best chances for precipitation nationally across the Pacific Northwest and light snow possible in the Great Lakes region. Much of the nation is likely to have a dry Christmas. Of course, this means those looking for a white Christmas are likely to be disappointed again this year, but this should be no surprise given our area’s history. Measureable snow has only fallen once on Christmas Day itself, in 1913 (3.5” total), though snow flurries have fallen on several other years, including last year. Snow has been on the ground Christmas Day from previous storms several times, most recently in 2004, with the greatest snow depth recorded in 1963 when a whopping 10” was still on the ground! That white Christmas followed one of the biggest snowstorms in Memphis history on December 22, which also resulted in the coldest low temperature on record for the city, a bone-chilling -13F on Christmas Eve morning! 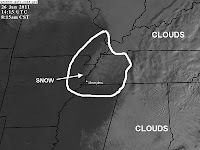 Video below is taken from public domain footage of a news story about the record snow just before Christmas 1963. 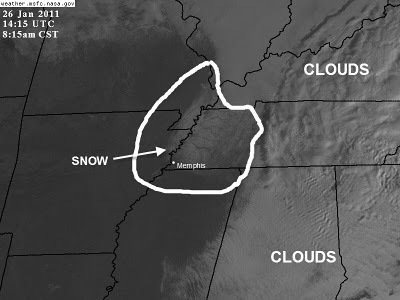 With confidence still rather low on Saturday’s weather, and the forecast subject to change, you’ll want to continue to stay with MemphisWeather.Net for the very latest updates. 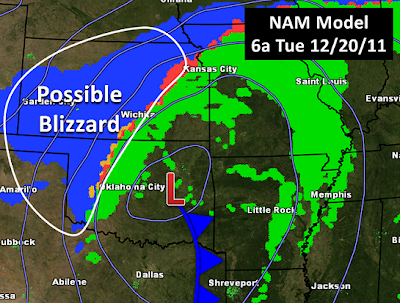 We'll keep you updated via the MWN Forecast and Facebook and Twitter. November reversed October's trend of cool and dry weather by averaging warmer and wetter conditions than normal for the month. The average temperature for the month of November was 55.9 degrees, which was 2.7 degrees above normal. 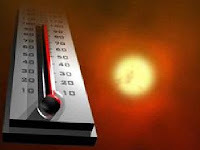 The average high temperature was 64.7 degrees and the average low was 47.1. The coolest temperature of the month was 31 degrees on the 29th and 30th, while the highest temperature was 79 degrees set on the 14th. The low temperatures of 31 on the last two days of the month were the only two days in which freezing temperatures were recorded, ending the 2011 growing season at 261 days or 30 more than the average season. Precipitation for the month totaled 7.71", which was 2.22" above average. There were 11 days with measurable rainfall (all recorded at least 0.10") and 5 of those days had more than 0.50". The greatest 24-hour total was 2.30" on the 21st. The peak wind gust was 45 mph on the 13th with an average wind speed for the month of 10.0 mph. Snowfall for the month totaled 0.1" due to a snow storm that brought 0.1" on the 29th and a trace on the 30th. Areas in the northern metro region saw snowfall totals of 1-2" from this snow event. Click here for a daily statistical recap for Memphis International Airport. The average November temperature at Cirrus Weather Solutions in north Bartlett was 54.0 degrees with a maximum of 77.9 degrees on the 14th and a minimum of 24.4 degrees on the 18th. November precipitation was slightly less than the Memphis airport, totaling 8.27", which was the wettest month at Cirrus Weather Solutions since May. A co-located manual gauge used for the CoCoRaHS program measured 8.84". Snowfall totaled 0.5" on the 29th and a trace on the 30th. The peak wind gust was 33 mph on the 13th. Average relative humidity was 71%. 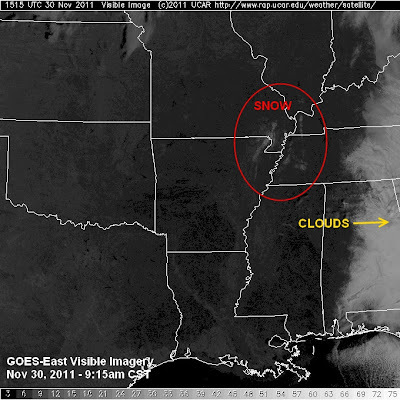 Click here for a daily recap on MemphisWeather.net. For the month of November, the average temperature error in all MWN temperature forecasts was 2.70 degrees, lower than all compared computer models including the NWS by at least 12%. Over 55% of the MWN temperature forecasts for the month were within 2 degrees of the actual temperature. MWN's forecasts extend out five periods (or 2.5 days). For dewpoint accuracy, the MWN forecast beat all data sources, averaging 2.40 degrees error and falling within 2 degrees of the actual dewpoint almost 66% of the time. Historical accuracy statistics can be found here.